In 2006 under the far-sighted leadership of the College of Borrego's Adult Education Program, the Pottery Program was created. After arranging for a large outdoor space on School District grounds the College and its patrons bought and donated the equipment necessary to open a working and teaching pottery studio. Ginger Dunlap-Dietz, a potter from Syracuse, NY was on hand to manage and organize the Pottery from the beginning. 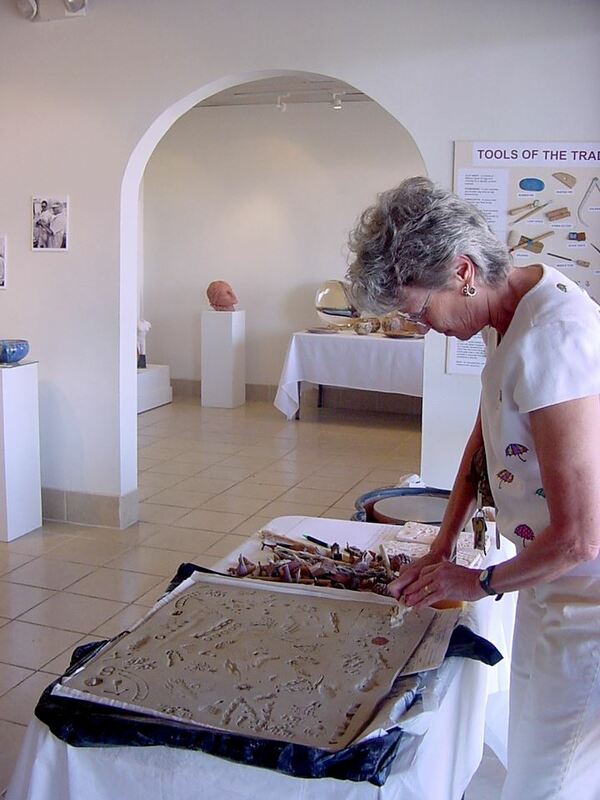 In 2013 the College of Borrego handed the sponsorship of the Pottery over to the Borrego Art Institute. In addition to continuing the on-going programs, in 2014 BAI initiated its first Celebration of Clay and Glass Show. The annual exhibition highlights local artists and introduces the work of talented clay and glass artists from around Southern California. Over the twelve winter/spring seasons the Pottery Studio has been open, it has grown; new equipment includes a raku kiln, new storage structures, materials, and new workshops. We are very proud of the significant group of people who have discovered the joy of working with clay and have made the studio a special place. Some have taken what they learned back to their homes in other locales and built their own potteries; some make the Pottery a focus of their seasonal time here in Borrego. Each year the Pottery is able to maintain limited summer hours. Under the guidance of the Borrego Art Institute, community awareness of the Pottery program is growing. With the assistance of interested donors, the goal this year is to build a new year-round facility for clay as a part of the ARTFARM at BAI. We expect that the future will bring a year-round presence, new guest artists, more workshops and increased interest in the clay medium and the art of ceramics. 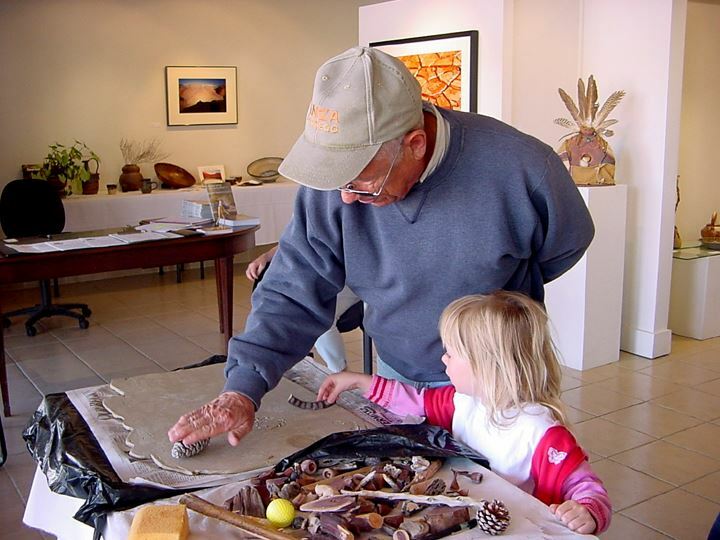 The first appearance of what are now called Community Tiles was in Expressions in Clay, 2008, the exhibition of clay at Borrego Art Institute in its original location in the Mall. The show included clay work by a number of Borrego artists. Artists from the newly formed Borrego Pottery were at work hand building and throwing on the potter’s wheel for visitors to see how pottery is made. In addition there were large rolled slabs of soft clay for visitors to imprint with natural items like nut shells, stones, plants, branches, fingers, etc. These slabs were then cut up into 4” tile shapes. The 75 or so tiles were bisque fired for later glazing. Over the next several years they were joined by tiles made the same way by the artist members at an Art Guild luncheon and at the Pottery’s Annual Holiday Open House by attendees and resident artists. In the the last 10 years members of the Pottery and the community have created more than 200 tiles. 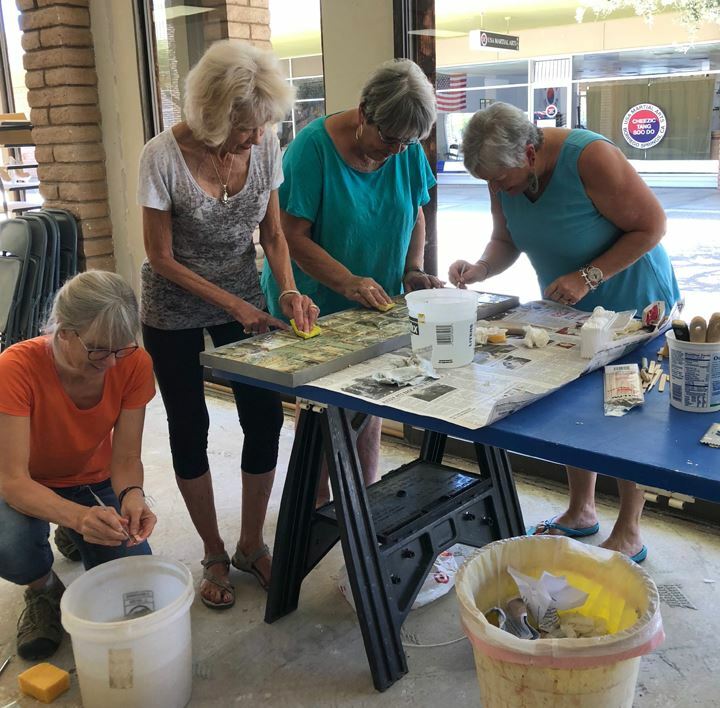 In 2017 Borrego Art Institute Pottery Program applied for, and received, a $10,000 matching grant from the National Endowment for the Arts to build a 30 foot wall mural of feature and narrative relief tiles Celebrating the Arts in Borrego Springs. 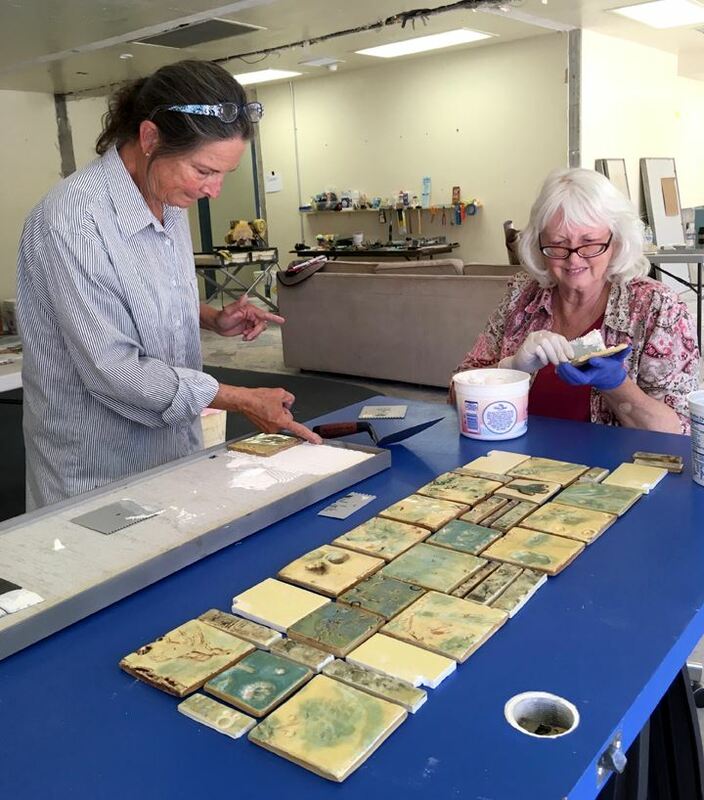 Glazing of our Community tiles happened simultaneous with production of new feature and narrative relief tiles at the Borrego Art Institute Pottery. They are used to create the border edges of the story panels as well as several individual panels. The mural, which Celebrates the Arts in Borrego Springs, is installed on the outside South wall of BAI and will be unveiled at a public ceremony scheduled for March 23, 2019 at 3:00 pm.